The United States has the third highest general top marginal corporate income tax rate in the world, at 38.92 percent. Due to the recent reduction in Chad’s corporate tax rate, the U.S. rate is exceeded only by the United Arab Emirates and Puerto Rico. The worldwide average top corporate income tax rate, across 188 countries and tax jurisdictions, is 22.5 percent. After weighting by each jurisdiction’s GDP, the average rate is 29.5 percent. By region, Europe has the lowest average corporate tax rate, at 18.88 percent (26.22 percent, weighted by GDP). The G7 has the highest simple average, at 30.21 percent. Larger, more industrialized countries tend to have higher corporate income tax rates than developing countries. 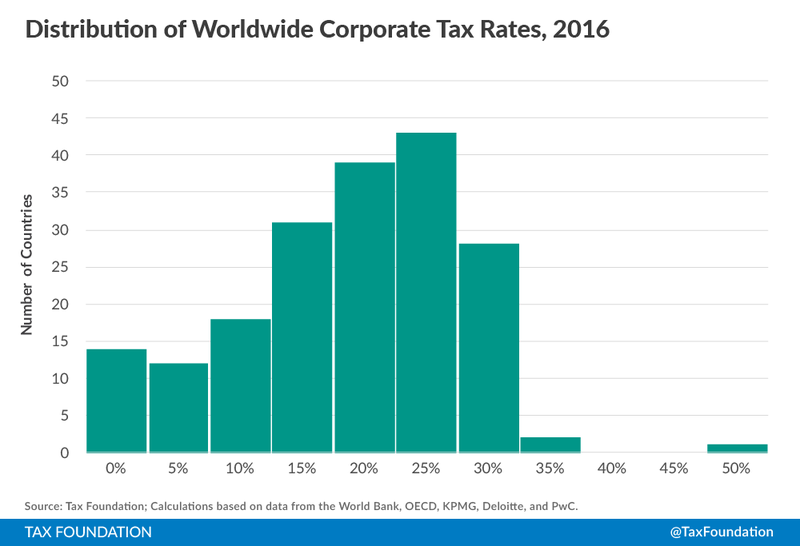 The worldwide average corporate tax rate has declined since 2003 from 30 percent to 22.5 percent. 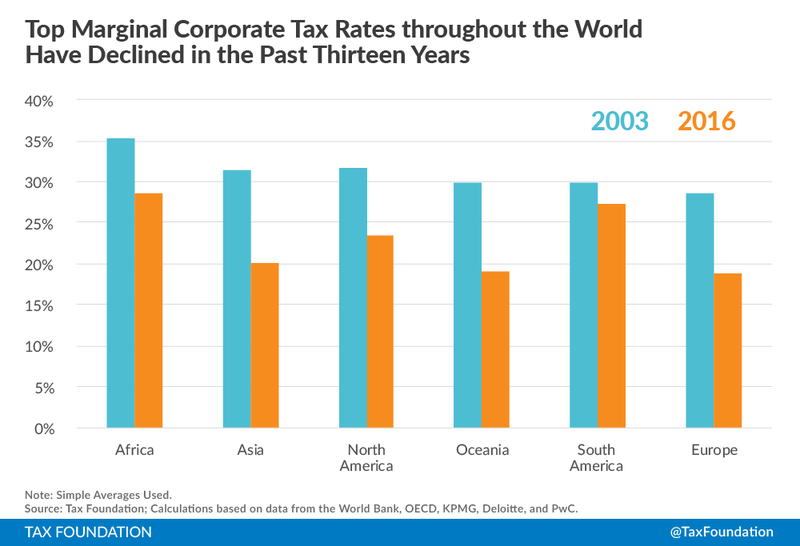 Every region in the world has seen a decline in its average corporate tax rate in the past thirteen years. It is well known that the United States has the highest corporate income tax rate among the 35 industrialized nations of the Organisation for Economic Co-operation and Development (OECD). However, it is less well known how the United States stacks up against countries throughout the entire world. Expanding the sample of countries and tax jurisdictions to 188, the U.S.’s corporate tax rate of almost 39 percent is the third highest in the world, lower only than the United Arab Emirates’ rate of 55 percent and Puerto Rico’s rate of 39 percent. The U.S. tax rate is 16.4 percentage points higher than the worldwide average of 22.5 percent and a little more than 9 percentage points higher than the worldwide GDP-weighted average of 29.5 percent. Over the past ten years, the average worldwide tax rate has been declining, pushing the United States farther from the norm. The top marginal corporate tax rate among the 188 countries surveyed was the United Arab Emirates, which has a top rate of 55 percent (Table 1). The United States, with a combined top marginal tax rate of 38.9 percent (consisting of the federal tax rate of 35 percent plus the average tax rate among the states), has the third highest corporate income tax rate in the world, slightly behind Puerto Rico. In contrast, the average across all 188 countries is 22.5 percent, or 29.5 percent weighted by gross domestic product (GDP). Every region in the world except for Oceania is represented in the top twenty countries. Six of the top twenty countries are in Africa, two of the top twenty countries are in Asia, and four are in Europe. The eight remaining countries are in South and North America. Other large nations in the top twenty besides the United States are France (34.4 percent), Brazil (34 percent), and India (34.6 percent). Of the 188 countries surveyed, there are currently 14 without a corporate income tax (Table 3). Most countries without corporate income taxes are small, island nations. Four of the countries are islands known for having no corporate income tax: the Bahamas, the Cayman Islands, the British Virgin Islands, and Bermuda. Bahrain has no general corporate income tax, but has a targeted corporate income tax on oil companies. Corporate tax rates vary significantly among worldwide regions (Table 4). Africa’s average top marginal corporate income tax rate of 28.53 percent is the highest among all regions. Europe has the lowest average tax rate at 18.88 percent, 3.6 percentage points below the worldwide average of 22.49 percent. Weighted by GDP, North America stands as the region with the highest average top marginal corporate tax rate at 37 percent. This is unsurprising given that the United States makes up more than 80 percent of the region’s GDP and has a corporate tax rate of 38.9 percent. Asia has the lowest weighted average top marginal corporate tax rate at 26.2 percent. Larger, more industrialized countries tend to have higher corporate income tax rates than the world as a whole. The G7, which is a group of the seven largest nations in the world by net wealth, has an average corporate income tax rate of 30.21 percent (33.75 percent weighted). The 35 nations of the OECD have an average corporate tax rate of 24.66 percent (31.39 percent weighted). The BRICS (Brazil, Russia, India, China, and South Africa, five major emerging national economies) have an average rate of 28.32 percent (27.39 percent weighted). above 35 percent. Seventy-five countries have corporate tax rates between 0 and 20 percent. Over the past thirteen years, countries across the globe have reduced their corporate income tax rates, considerably reducing the worldwide average tax rate (Figure 2). In 2003, the worldwide average was approximately 30 percent. By 2016, the average rate had declined by roughly 7 percentage points to 22.5 percent. 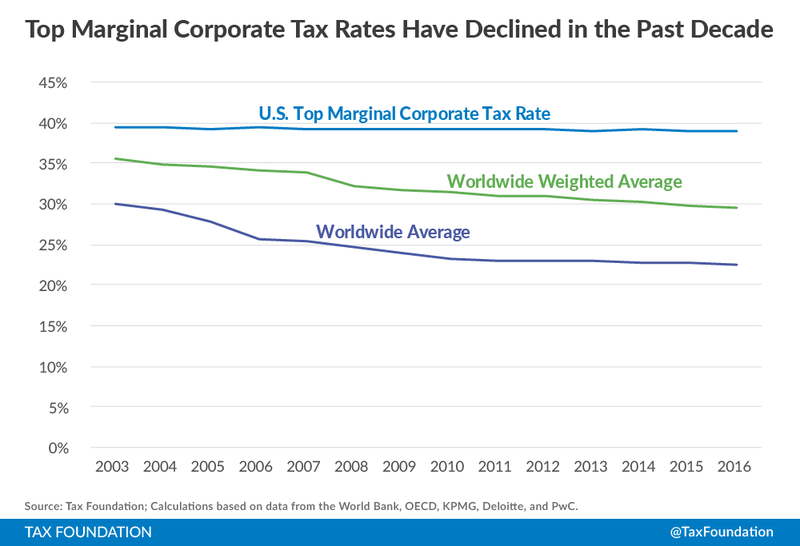 After weighting by GDP, the average top marginal corporate tax rate has declined less. This is mainly due to the fact that the United States, which makes up approximately 25 percent of world GDP, continues to have a high 38.92 percent corporate income tax rate that has not changed in more than 10 years. Nonetheless, the worldwide GDP-weighted average tax rate has declined from 34.1 percent to 29.5 percent in the last 10 years. This downward trend holds across all regions of the globe (Figure 3). The average top marginal corporate tax rate in all regions has declined in the past thirteen years. tax rates the least, from 29.9 percent to 27.27 percent over the last thirteen years. The corporate income tax rate is one of many aspects of what makes a country’s tax code and economy attractive for investment. 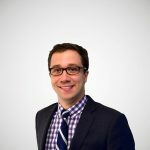 However, as the rest of the world’s economies mature and their tax rates on corporate income continue to decline, the United States risks losing its competitive edge due to its exceptionally high corporate income tax rate. OECD Tax Database, Table II.1 – Corporate income tax rates: basic/non-targeted, May 2016, http://www.oecd.org/tax/tax-policy/tax-database.htm. the tax is levied mostly on oil companies and foreign banks. For more information see PwC, Worldwide Tax Summaries: Corporate Taxes 2013/14, http://www.pwc.com/gx/en/tax/corporate-tax/worldwide-tax-summaries/assets/pwc-worldwide-tax-summaries-corporate-2013-14.pdf and Taxation in the United Arab Emirates, Galadari & Associates, http://www.galadarilaw.com/uploads/brochures/172113_Tax.pdf. and the OECD Tax Database, Table II.1 – Corporate income tax rates: basic/non-targeted, May 2016, http://www.oecd.org/tax/tax-policy/tax-database.htm. GDP calculations are from the Department of Agriculture International Macroeconomic Data set, December, 2015, http://www.ers.usda.gov/data-products/international-macroeconomic-data-set.aspx#.U-pNdfldVMc. Here, “major industrialized nation” refers to members of the Organisation of Economic Co-operation and Development (OECD). The rate can be as high as 46 percent. Deloitte, International Tax Guide, 2016.